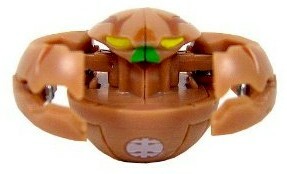 Terrorclaw is a large crab-like Bakugan. It has two large, strong, and sharp pinchers used to squeeze its enemies. With six legs, it's one of the fastest monsters. Runo's Haos Terrorclaw was the first of her Bakugan to go to the Doom Dimension. Marucho, Klaus, and Jenny all have Aquos Terrorclaws. Shuji and Akira both have a Subterra Terrorclaw. Dan also has a Pyrus Terrorclaw. Its name sounds like the Battle Gear Terrorcrest. Purchase TerrorClaw from Amazon now!